Maybe you missed it, but Apple released a bunch of new iPhone stuff last week. Who knew? The 7.7 release of iTunes added the App Store, and the 2.0 firmware now allows me to run the first apps on my iPhone, w00t! Reviews have begun to arrive, and apparently, the most popular price point has risen from free to $0.99. Not a big surprise there, since that’s what songs cost on iTunes. I agree with the sentiment that some app developers have way overpriced their offerings. Personally, I’m sticking to free (as in freedom, at least from my perspective) until something really kickass comes along. I’ve tested out quite a few apps, and now, gentle reader, I’ll share some thoughts. First off, the top of the heap so far has to be Pandora. I’m not alone in this opinion, although crowing it the killer app is a bit odd to me this early in the game. I’ve been roadtesting Last.fm and Pandora this week because I’m getting a little tired of my library of songs, and one of the cool things about these apps is they recommend new music based on your listing. This is a plus for me, i.e. back to boredom aspect. I started with Last.fm, but it’s bit clunky and slow. Plus, it took me a long time to “scrobble” my main playlist. Its client is pretty, but its iPhone app is full of fail. I couldn’t get it to load on the Edge network. I’m hoping this was a launch glitch and not a 3G or no-G issue. Paul recommended Pandora as a better alternative and so did Rich. So I tried it out and so far, I agree. It’s easier to get started and their iPhone app is great. It works well over Edge, and the more you listen, the better it gets at recommending music. As with the web version, it has an instant gratification button, i.e. “Buy this Song on iTunes”. Very cool stuff. 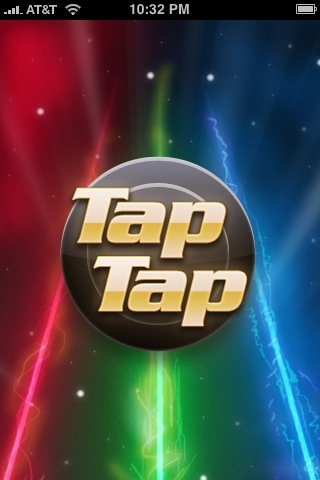 I downloaded and played my first game tonight, Tap Tap Revenge, a Guitar Hero style app for three fingers. Lots of fun, but there aren’t many songs. And they’re all techo beats. I’ve tried Twitterific and Twittelator as clients for Twitter. Neither is very compelling. Frankly, I prefer Hahlo, which has been the top Twitter iPhone app for me for ages. I do still enjoy the Remote app. It works over wi-fi, so I’m planning to upgrade my wife’s iTunes, add her library and freak her out from downstairs, playing random songs. That should be a laugh. Jott and Evernote have nice apps, but I still haven’t been able to commit to using either service. However, I think if I ever get there, their iPhone apps will be very useful. The Google and Facebook apps seem redundant to me, since they are very similar to the iPhone web apps these companies already released. Finally, I have WeatherBug and Where. I haven’t really used either very much yet, but both are very slow over the Edge network. 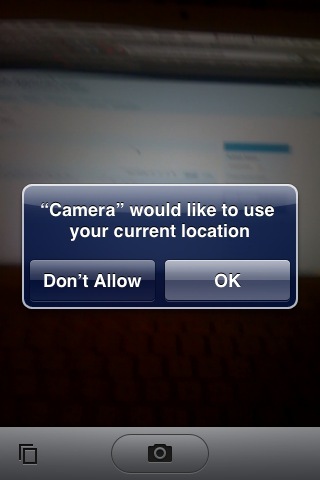 Most of the apps ask if they can use your location data, even if there’s no obvious reason why, e.g. why does the Camera app care about my location? TechCrunch suggests that MySpace and Facebook have missed the boat so far because their apps do not use location. Location and cell phones was one of the promises of Bluetooth back in the day; remember the killer app of broadcast ads to Bluetooth compatible cell phones nearby? I can’t imagine the outcry if that had gone into production. So, while I agree it has potential, I think people may have a paranoid barrier that prevents mass adoption. Overall, apps seem pretty average, but the one big complaint I have is they can’t run in the background, which we’ve known since the SDK and license terms were announced. This is critical, and it may drive me to an unlock eventually. Take Pandora for example. While writing this post, I took some screen captures (still a kickass new feature) and wanted to bounce over to mail them to myself from the Photos app. Pandora has to exit, which means no music. Of course, not so with the iPod app, which happily plays in the background while you move around the iPhone O/S. This is a huge loss for users and app developers alike. Without background processing, computing fails. Aside from apps and the screen capture nugget, I have noticed some cool stuff in the 2.0 update compared to 1.1.4. First of all, it doesn’t crash as much. 1.1.4 had become seriously unstable for me, crashing frequently in a lot of useful apps. Mail also has multiple deletes, which saves time and iterations. Still no copy/paste, another major gap. What do you think of apps? The 2.0 firmware? Are you a newly-minted iPhone geek? Do you love it? Tell us all in comments. I agree Pandora is great! I just got my first iPhone and so far so good, my prev phone was this WM5 PPC brick. Listening to online streams was a pain and full of “bufferings”. Now I have been plugin in my iPhone to my car and no skips whatsoever!My 15-20 min commute has become a treat! BTW if you really want to freak your wife out; enable ssh into her mac- from your terminal ssh to hers and type – $say Hello yourmessagehere . I did it to my wife for a while until she found it was me! 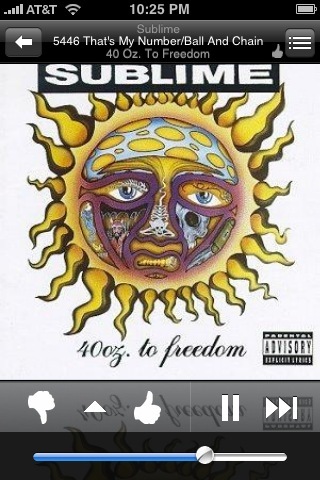 Agree on Pandora being great. In terms of cool, but only mildly useful, get UrbanSpoon! Keep us updated with your iPhone thoughts. I'm curious about how well the 3G one performs and how much it really costs. I like the Matrix moment, “Hello, Neo.” trick. Good tip. I did see Yelp! mixed into the Where app, but didn't spend time on it. Useful is a stretch for iPhone so far. The rumblings about how enterprisey it really is have already begun. Our internal calendar won't sync, even with various hacks, VPN is a no-go since there's no way to put a cert on the phone (w/o an unlock), etc. So, for now, I'm adding the “for business” claim to the list of bogosity with “twice as fast” and “half the cost”. I have to agree about the background apps. That was the killer feature of my Nokia. I would be driving along and it could warn me of upcoming speed traps and speed cameras through Trapster. But by far my favorite was an app called Best Profiles. Based on my location, calendar, and schedule it would switch between super loud (at home) and vibrate mode (if I'm in a meeting). I got so used to it that I'm not the guy in the meeting with the blaring cell phone. Lets hope that the background stuff changes soon because it opens up too many possibilities that push tech will never solve. Very cool stuff. It's very limiting to: 1) have Pandora stop playing when I switch over to check mail or tweet and 2) have the phone lock itself while the radio is playing. Apps should be able to manipulate these types O/S-level processes. Unlocked iPhones do run apps in the background, which is nice, I hear. Have you tried using the headphone jack with Pandora at all? I plugged it in my truck and it sounds like garbage compared to the iPod output. Someone told me it was something about the API not allowing access to built in DAC. I'm also getting some constant crashes on some of the apps like facebook, twinkle, etc. Hoping there is a patch soon. Haven't tried the headphone jack in my car yet, but I plugged it into my my mini-speakers, and it sounded great. They use the sync interface, so maybe that's the difference. I've used headphones to listen to Pandora though, and it sounds fine. I haven't seen too many issues with 2.0. 1.1.4 was way buggier for me, but you're not the first to complain of issues. Maybe reinstall it? I'd expect a batch of fixes soon, if only to defeat the unlock/jailbreak. Didn't Apple learn from Hughes' battle with hackers a decade ago? You can't hope to win that battle.